SALT LAKE CITY, Nov. 9, 2011 -- Northrop Grumman Corporation (NYSE:NOC) recently provided grants worth a total of $6,500 to support science, technology, engineering and mathematics (STEM) educational initiatives in Salt Lake City area schools, including a science and math competition for students in grades 4-6. Northrop Grumman awarded a $5,000 grant to the Davis School District for the annual Elementary Science and Math Olympiad, which provides hands-on opportunities for students to learn math and science concepts. It aims to foster an early excitement and appreciation of these subjects to increase the chances that students will pursue careers in engineering, science or math. Additionally, Northrop Grumman has provided five individual grants of $300 each to teachers in the Salt Lake City area to support general STEM educational initiatives in their classrooms. The grant to the Davis School District will be distributed to teachers in multiple elementary schools for materials to be used throughout the school year by thousands of students as they prepare for the district-wide Olympiad that will be held in May 2012. Past events at the competition include a floating glider competition using planes created by students and a barge-making competition using aluminum foil. 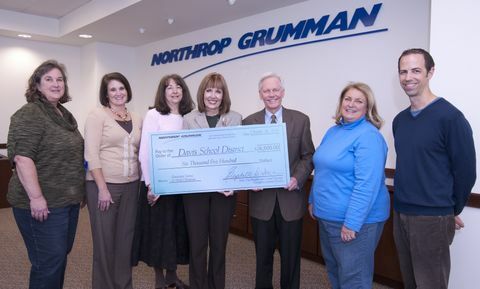 "The teachers in the Davis School District who were awarded grants from Northrop Grumman were thrilled to have been chosen as recipients," said Rita Stevenson, elementary science supervisor of the Davis School District. "These funds will be used to support STEM initiatives in the classroom and will have a direct impact on student learning." "Northrop Grumman recognizes the importance of encouraging student interest in science and math during the formative years since it has great potential to influence educational and career aspirations later in life," said Liz Iversen, sector vice president and general manager of Northrop Grumman's Navigation Systems Division. "These grants are part of the company's broader, ongoing commitment to STEM education." Northrop Grumman regularly contributes to programs designed to encourage student interest and career aspirations in the STEM fields. The company annually sponsors Worthwhile to Help High School Youth, a mentoring and scholarship program for high school students, and the Northrop Grumman Engineering Scholars program, which provides academic-based scholarships to promising high school seniors who plan to pursue a career in engineering.